15th feb'2013 is Saraswati puja. I totally would have missed it if a friend would not have invited us to join some puja here. Its totally unlike me not to remember and its more unlike me to realize that I don't want to join it. I love any festivities that brings friends and family together, it always puts a smile on my face but somehow this time I just dint feel like going all the way with a plastered smile on my face, meeting new people and thinking all the time if everything looks perfect, coming back home irritated, without making any friend and touching any heart. No, thats not my kinda life and definitely not the festival I cherish. Saraswati puja is supposed to be a fun festival for the young people and this young section include people from 4 to 24. the fact that it also gets celebrated by the school and colleges makes it extra special for students. that special day when your friends see you in something other than the regular school uniform. Those special occasions when mothers allows their little and not so little girls to choose a saree from their almirah and help her wear it in the morning. They turn and twist and see their own reflections in the mirror. Is that the little one whom I gave birth just a few years ago, thinks the mother with a long sigh to realise how time flies by. Is that really me, thinks the little girl with a twinkle in her eyes and a suppressed shy smile on her lips. she feels special today. Extra careful to walk, to laugh and never miss any chance to catch her own reflection in the mirror, sometimes to place the bindi perfectly between her brows and sometimes just to see who all her checking her out...that's the highlight of this festival. the only day without the sharp gaze of parents and teachers or the nosy neighbours, you get to mingle, you get to laugh out loud with friends without differentiating between the gender. When I look back I see a vivid collage of memories, myriad moments all in bright happy colours...those precious moments of talking to someone through your eyes, those sudden touch, eating lunch from the same plate and then few stolen moments in the crowd. Or waking up in the middle of the night to pluck flowers from neighbours garden, losing your slipper when he wakes up and chases you, or those not so perfect alpona on the pandal ground, then late morning walk from home to home in your neighbourhood distributing prasad. Its not that am missing it. I had my share and I lived it, but am just not ready to get caught in some pretentious competition regarding any material thing. I rather will prefer to play the role that my mother played, Providing everything for my little one and his friends when he will make memories. Now no festival in India is complete without food and Saraswati puja being a community festival involves cooking for mass. 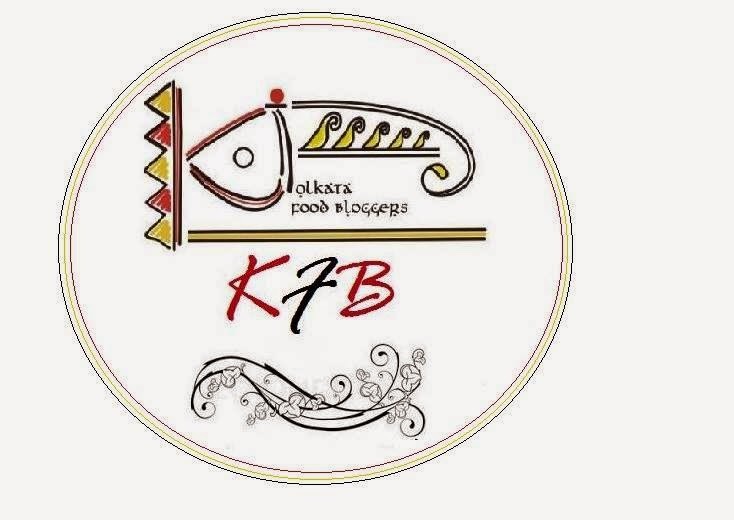 The easy recipes that generally gets cooked during this time is the bhoger khichuri, labra, Bandhakopi'r ghanto and chutney. 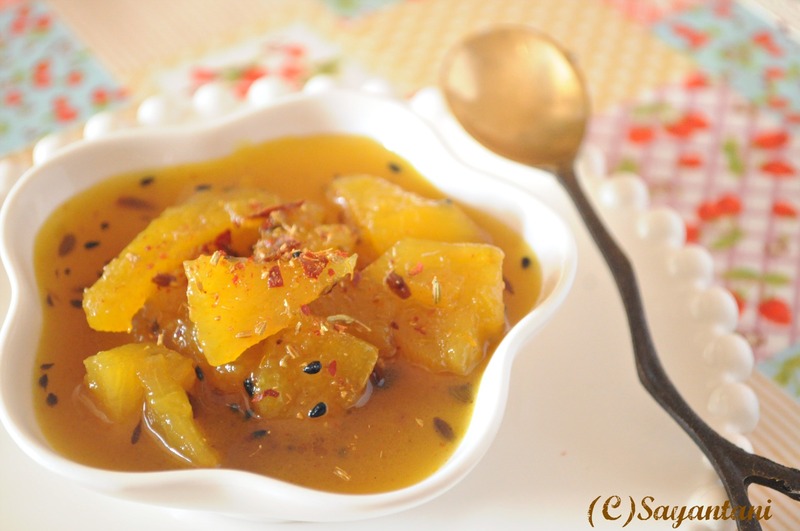 Today am sharing a simple chutney with Pineapple. called Anarosher chaatni. The highlight of this dish is the mustrad oil. If you are making the chutney then I will urge you not to substitute it with anything else. 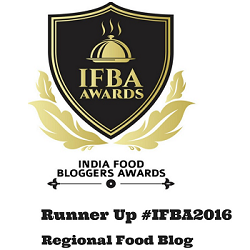 If you are regular on my blog then you must have noticed that am very particular about flavour profile. I choose one flavour and let it shine either by not using any other or by using herbs that support it. Similarly in this dish too I never suppress the very flavour of pineapple by using anything else other than some roasted fennel seeds at the end. Dry roast half of the chili and the fennel seeds. once they change colour coarsely grind in a mortar and pestle. keep aside. Heat the oil till its smoking and then add the panch foron and half of the chili. Once they start to splutter add the chopped ginger. Stir for a couple of seconds and then add the chopped pineapple. Mix in salt and turmeric (only a pinch of each). On low heat cook it for 4-5 minutes. Be careful not to caramelise them. The pineapples should not change colour rather get cooked in its own juice. Mix in the sugar and cook for a minute. Add 11/2 cups of water. let it simmer under a lid for 15 minutes or till the fruit is soft to your liking. Please do not overcook and make it mushy, they should hold their shape and the gorgeous sunshine-y yellow colour. after the initial cooking of the pineapple I cooked ir for exactly 15 minutes. once you are happy with the consistency of the chutney consistency switch off the flame. Add the lemon juice and the roasted fennel seeds. mix and serve wither chilled or at room temperature. This stays good for 5-7 days if stored in fridge. I love to end my meal with this slightly sweet-sour-spicy note but if you want go ahead and dry up the juice little more. Then spread it on a piece of cracker and cheese. Perfect finger food for an afternoon high tea. Do not add the sugar along with the fruits. Like any other fruit or vegetable sugar will make it hard to cook. Be extra careful not to caramelise the pineapple pieces. You will miss the gorgeous sunny hue of yellow in that case. 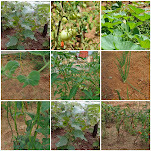 chutney, chatni recipe, bengali style chutney recipes, anaros, anarosher chutney. pineapple chutney. sweet and sour chutney recipe. cracker and chutney recipe, how to make pineapple chutney. 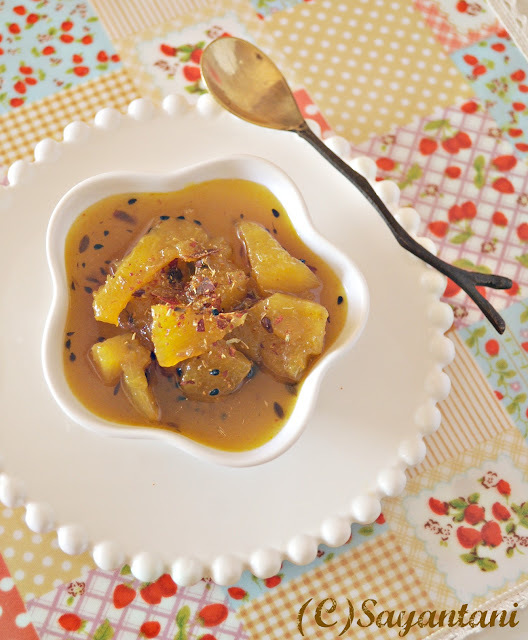 pineapple pachhadi, pachadi, spicy pineapple relish, what to make with pineapple. Yummy. I have had a thicker chatni with pineapple but this one looks more chatpata types. Lovely. I love pineapple but never had it like this...I m sure it will taste great with sweet and spicy combo..
What a lovely post Sayantani. The way you have described the puja is so beautiful ! I am with you on how we'd rather make memories for our little ones that attend something for the sake of it. 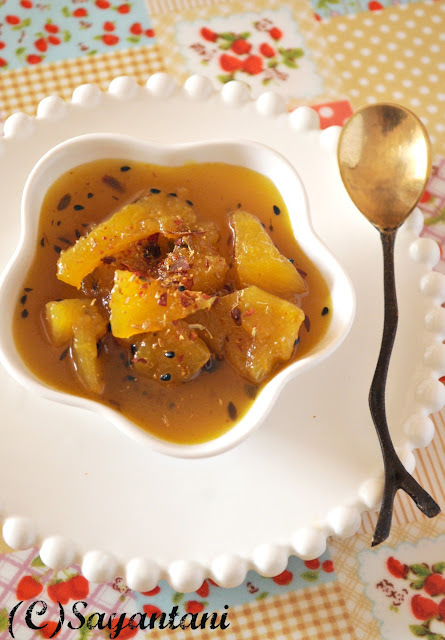 loved pineapple chutney,but never tried with panchphoran,,looks delicious and tempting.. This is such a heart warming post Sayantani and pineapple chutney simply adore it. so desserty ! My friend from Odisha made a similar chutney with raw mango and shared it with me. This looks very inviting.